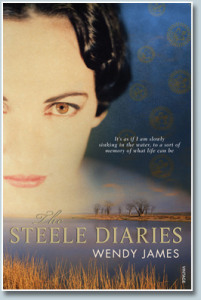 The Steele Diaries, Wendy James’ second novel, originally published in 2008, has recently been re-released as an ebook by Momentum. It’s a novel I’ve looked forward to reading since I discovered a paperback copy on my local library’s discard table. I’d enjoyed James’ The Mistake when I read it as part of the AWW challenge last year and I was hoping for another compulsive read. This novel didn’t disappoint, but it was different from what I’d anticipated. The Steele Diaries takes a more considered approach than The Mistake, and it wasn’t till halfway through that I felt compelled to keep on turning pages. Loosely, it covers the same territory: family drama – or “Suburban Noir” – with the possibility of crime. 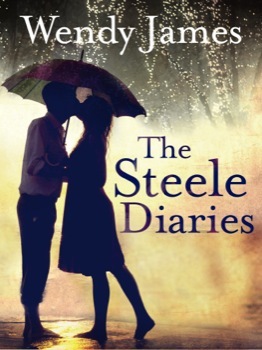 In The Steele Diaries, the story unfolds at a gentler pace and has a more literary feel than The Mistake. In the end, however, it packs a similar punch and is arguably even more thought-provoking. According to James, who was interviewed by Kirsten Krauth last year, the novel was inspired by “stories of various artists’ and writers’ lives — in particular Joy Hester, Sunday Reed, Sylvia Plath, Vanessa Bell, [and] Angelica Garnett — and their differing experiences of motherhood and childhood”. There’s no glossy, sentimentalising of motherhood here; rather, the depiction of the fraught nature of disappointed dreams and imperfect relationships makes for, at times, uncomfortable and confronting reading. The drama revolves around three women: Ruth, a middle-aged doctor who has recently lost her father; Zelda, Ruth’s mother, an illustrator of children’s books; and Annie, acclaimed artist, Zelda’s mother. It weaves first person narratives from Ruth and Zelda – Zelda’s section being quite literally a “diary” – with a brief account of a time in Annie’s life, as imagined by Zelda. While depicting the complex and painful relationships between these mothers and daughters, the story dramatises the pressures which childbearing places on a woman’s creativity, sense of autonomy and mental health. It draws on themes familiar to folk and “fairy” tales, the terror of abandonment and the hinted possibility of a mother’s indifference to her child, an indifference which borders on brutality. Such unsafe – even grotesque – preoccupations are reflected in the Art described in the novel, both in Annie’s paintings and Zelda’s wood-block illustrations, as well as in the narrative. Readers are positioned as eavesdroppers or voyeurs on these women’s private lives, a narrative strategy which creates a self-reflexive meditation on Art as a vehicle for telling unpalatable truths, particularly about women’s “failures” to live up to their own and others’ expectations. In portraying these failures, the story both stretches and tests our capacity to respond with sympathy. Given the weight of the book’s themes, you’d have to wonder about the covers, both the original – with its face of a beautiful, carefully coiffed woman floating over an Outback scene – and the more recent offering from Momentum, with coy lovers kissing under an umbrella. Both are seriously misleading. So many novels by women — especially those writing about domestic life — are given covers that don’t quite match the content. My first two novels — one about an infanticide, the other about art and motherhood — were marketed as romances. This misrepresentation certainly doesn’t help establish a readership. Whatever genre you might call The Steele Diaries, it’s not a romance. Momentum book designers, what were you thinking? 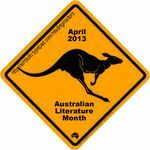 This review counts towards Australian Literature Month hosted Kim at Reading Matters (who will donate 50p to the Australian Literacy Foundation for every review of an Australian book during April) as well as Australian Women Writers Challenge 2013.